Bohemian Talmudist; died May 30, 1624, in Prague. He was assistant rabbi and magistrate of the community, and was son-in-law of the chief rabbi of Prague, Lewa ben Bezaleel, and the father of Ḥayyim ha-Kohen (rabbi at Frankfort-on-the-Main and at Posen) and Naphtali ha-Kohen (rabbi at Lublin). Isaac was in the habit of writing acrostic introductions to his own and other works. He wrote: a supplement to "Ḥatan Damim," a commentary on the Pentateuch by Samuel Runkel (Prague, 1605); glosses to "Pa'neaḥ Raza," a small cabalistic work by Isaac ben Judah ha-Levi (ib. 1602); a commentary on the Pentateuch, in German (ib. 1608); notes on Midrash Tehillim (ib. 1613); "Ḳiẓẓur Mizraḥi," a commentary on Rashi to Genesis. 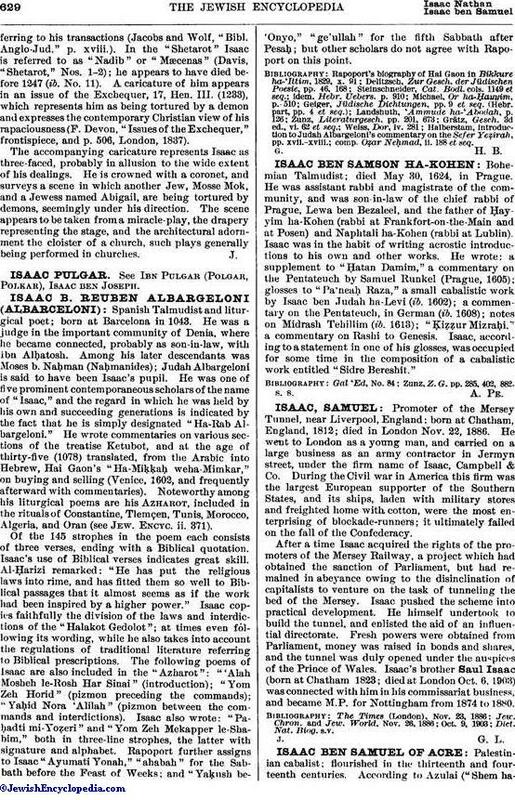 Isaac, according to a statement in one of his glosses, was occupied for some time in the composition of a cabalistic work entitled "Sidre Bereshit." Zunz, Z. G. pp. 285, 402, 882.